Finally An Interface For Guitarists! Sono is the ultimate audio interface for guitarists, combining Audient’s award-winning analog recording technology with the world’s best speaker-cab simulation from Two notes. You’ve spent years perfecting your sound, why compromise now? Sono provides over 20 years of analog console design heritage on your desktop. Get studio quality recordings with two of Audient’s renowned console mic preamps. 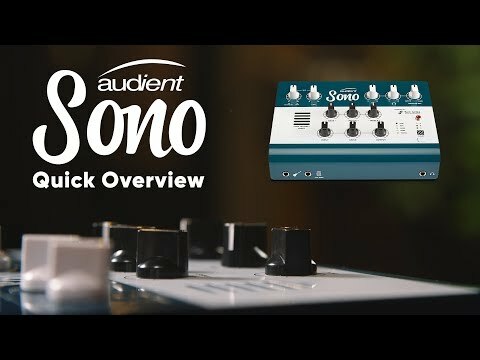 Combining an onboard 12AX7 analog valve and 3-band Tone control with Two notes Torpedo power amp modeling and cab simulation, Sono lets you quickly create, record and store the guitar sounds you hear in your head. Hear subtle detail, make better mix decisions and experience remarkable clarity from the moment you press play with Sono’s class-leading converter technology. Record through your favorite amps - Pick and choose from a wide range of guitar and bass cabs models and play through or record classics such as the Marshall 4x12, Fender 2x12, Ampeg 8x10 and many more. Create your ultimate rig - Customise everything from the room type, microphone model and placement to the harmonic distortion and more - all from an intuitive desktop app. Once you find a tone you love, store up to 3 presets on board. Join the online community and find your perfect cab with the Two notes online cab store. Browse new cab simulations from the industry-leading guitarists & studios, ideal for any genre. Integrate your existing pedalboard - Plug in your favorite reverb, delay or distortion pedals and combine your unique sound with the power of Two notes and start recording your favorite tones. Fine tune your sound on the way in with Sono’s 3 band analog EQ and add body to your heavy tones or that extra bit of sparkle to your clean tones. Simply load up your go-to sound and start recording instantly without the need to mic up and play through a noisy amp - perfect for home studios. No need to set up big rigs or turn on your computer, just load up your favorite preset, plug in your headphones or speakers and start jamming without the risk of annoying your neighbors. Don’t let latency get in the way of your creativity. Monitor mix allows you to blend between the input signal from your guitar and DAW playback, letting you record and monitor without delay. Sono always records a clean D.I signal, so you can capture your performances as creativity strikes and re-amp through your favorite hardware amps later. Sono can store up to 3 separate cab sims onboard, letting you take your tones on the road. Be ready to play a gig or capture an idea with the sounds you love, no matter where you are. Ever play that once in a lifetime gig but have absolutely no evidence of it ever happening? Hook up Sono to a laptop, open your DAW, hit record and share your performance with the world. Quickly take control of complex routing setups or low latency cue mixes for your artists, in Sono’s easy to use mixer app. Sono’s all metal construction is built to last and ready to travel. Be ready to write, record or jam with the sounds you love no matter where you are.